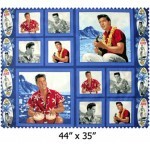 Elvis Presley fabric for quilting, apparel, craft and decorating projects. AS-IS Elvis 33" diameter cotton Christmas Tree Skirt and Ornaments Panel. AS-IS Ink from printer ro..
Irregular panel is a misprint. Panel is printed with 13 of the normal 16 ink colors. Our picture sh..